John J. “Johnny” Wilson, 98, Logansport, formerly of Deer Creek, passed away at 6:30 a.m. Monday, August 6th, 2018. 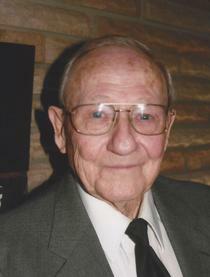 He was born October 3, 1919, in Washington Township, Cass County, to Clarence A. and Alta M. Davis Wilson. On Christmas Day, 1938, he married Pauline Hall: she passed away September 6, 2015. John graduated from Young America High School, and for a few years, he was part of a comedy team, The Yankee Hillbillies, with the late Tom Fouts aka Captain Stubby. It was a time he loved re-telling, reminiscing about the fun and silly skits. He retired from Logansport Machine Company after 40 years, where he had attained the position of senior design engineer. He was awarded a patent on a specialty designed “chuck”, a great accomplishment for someone who was basically self- taught in his field. Before and after retirement, he and Pauline enjoyed traveling throughout the Mid- West, South, and Canada, in their travel trailer. John loved and played several sports, including basketball, fast pitch softball, community and industrial league baseball, church league dart ball and bowling, and played golf for many years. Over the years he served as Deacon and Elder of Deer Creek Presbyterian Church, Clerk of Session and Presbytery Trustee, and was a delegate to General Assembly. At LifeGate Church, he and Pauline led a prayer group for many years. John also was assistant scoutmaster of the Deer Creek Troop, charter member of the Deer Creek Conservation Club, served as Carroll County Park Board superintendent for 3 years and was Hopewell Cemetery Secretary/Sexton for many years. Together John and Pauline had attended Deer Creek Presbyterian Church, and later called LifeGate Church their church home. Moving from Deer Creek, where he and Pauline had lived most of their married life, and where they had built their home themselves, John spent the last 3 and ½ years at the Neal Home, where he made many friends with the residents and the staff. They all became family, and the care, love, and helpfulness of the people there was something he and his family cherished. He loved playing euchre and had a winning day just the day before he became ill. Most especially, the days after he became ill, Great Lakes Caring provided wonderful support and caring from the nurses, aides, chaplain, and social services director. Their advice, concern, love, and time invested with him and his family was invaluable. John had many visitors that he loved chatting and reminiscing with. And they were all appreciated—former coworkers, family, church friends from Deer Creek Presbyterian and LifeGate, community friends, and especially weekly visits from Roger Myer, Pastor Harry Roselle, and Mike Munson. Whether or not he always remembered who visited that day, he loved that they came. Great grandchildren: Skyler Lincoln, Rebecca Bailey (Chris Pelnar), Lauren (Ryan) Reid, Evan Ridenour and Kyle Ridenour. Great-great grandchildren Alexandria Pelnar and Emilia Pelnar. One brother-in-law, Dale Henry, Walton and a special niece Pat Lewis. Preceding in death were: his parents, wife Pauline, daughter Judith Lynn; sisters Lucille Wilson, Freda Kistler, Helen Houser, Margery Myers; son-in-law Larry Bailey.